Tcell activation is a sustained process driven by MHC class I- and II-restricted Ags, costimulatory molecules, and cytokines provided by the APC (1). The role of dendritic cells (DC) 4 as regulators of the T cell response is well established (2). Immature DC (iDC) and their precursors migrate from blood to peripheral tissues, where they capture and start processing exogenous Ags (3). After migration from periphery to lymph nodes (LN), DC undergo terminal differentiation into fully mature APCs capable of priming naive T lymphocytes (4). However, T cell differentiation requires sustained signaling for dividing cells (1), which is unlikely mediated by a single DC. Sustained Ag sampling ensuring a continuous flux of highly activated DC into the LN might be accounted by inflammatory chemokines recruiting successive waves of iDC and monocytes into ports of pathogen entry. Alternatively, it is conceivable that Ag be released from activated DC and captured by neighboring DC that did not directly encounter the Ag. Some reports indeed describe the possibility of an APC to APC cross talk for T cell activation (5, 6, 7, 8). To avoid Ag dilution to levels below the T cell stimulatory threshold, the cellular mechanism allowing Ag sampling might involve efficient processing and targeting molecules. Exosomes are small MHC-bearing vesicles (50–90 nm) of endocytic origin secreted by a broad array of hemopoietic and epithelial cells (9, 10, 11, 12, 13, 14, 15). These vesicles originate from multivesicular bodies and are released in the extracellular milieu upon fusion of multivesicular bodies with plasma membranes (16, 17). The first observation that exosomes exhibit functional MHC molecules was made by Raposo et al. (11) using exosomes from EBV-transformed B lymphocytes to trigger CD4+ T cell hybridomas. Later, we showed that exosomes released from DC pulsed with tumor Ags induce potent T cell-dependent antitumor effects in tumor-bearing hosts (12). Therefore, extensive molecular characterization of DC-derived exosomes was undertaken, highlighting the discrete protein pattern of exosomes with abundant MHC, constitutive heat shock protein 73, and CD86 molecules. Overexpression of proteins involved in cell to cell contact (CD11b, tetraspans) and targeting (lactadherin) strongly suggested that exosomes might initiate or amplify the initiation of T cell-based immune responses in vivo (18, 19, 20). In this study, we bring evidence that: 1) DC produce exosome-associated MHC class I complexes that are transferred in vitro for optimal CTL priming; and 2) exosomal MHC class I molecules substitute for those expressed on plasma membrane of mature DC (mDC) for the initiation of synthetic peptide-specific, MHC class I-restricted CD8+ T cell responses in vivo. Indeed, priming of Mart1-specific CD8+ T cells in HLA-A2 transgenic mice using 2 × 109 HLA-A2+/Mart1-bearing exosomes was as efficient as 3 × 105 mDC loaded with saturating μM ranges of Mart1 peptides. Because 2 × 109 exosomal MHC class I molecules can be released by 104-105 DC in vitro and because exosomes require transfer onto DC to activate CD8+ T cells, exosomes can be viewed as an amplification process for DC-mediated CTL responses. Monocyte-derived DC (MD-DC) were generated from purified monocytes in bags (Nexell, Brussels, Belgium) under adherence-free conditions, as previously described (21). DC were differentiated from monocytes cultured in AIMV supplemented with 1000 IU/ml human rGM-CSF and 700 IU/ml human rIL-4 (Schering-Plough, Kenilworth, NJ). Otherwise, DC were also generated from the adherent fraction of PBMCs. Briefly, PBMCs were isolated by Ficoll-Hypaque density-gradient centrifugation and plated at 3–5 × 106 cells/ml in AIMV (Life Technologies, Paisley, U.K.) supplemented with 50 U/ml penicillin, 50 μg/ml streptomycin, 2 mM l-glutamine, 1 mM Na pyruvate (Life Technologies), and 10% decomplemented FCS (Pan Biotech, Aidenbach, Germany). Bulk lymphocytes were depleted by a 3-h adherence at 37°C, followed by three washing steps in saline buffer. Adherent cells were propagated in AIMV complete medium containing 1000 IU/ml of both human rGM-CSF and human rIL-4 (Novartis and Schering-Plough, respectively). For in vitro testing, DC were used at day 6. Maturation was induced by LPS (1 μg/ml; Sigma-Aldrich, St. Quentin Fallavier, France) for 24 h. PBMCs and MD-DCs were assayed by flow cytometry analysis with MA2.1 Ab-containing ascitis, CD14 (BD Biosciences, Heidelberg, Germany), CD1a (BD PharMingen, Heidelberg, Germany), CD83 (BD PharMingen), HLA-DR (BD PharMingen), CD80, CD86, and CD40 (BD PharMingen). Mouse bone marrow-derived DC (BM-DC) were cultured, as previously described (12). Briefly, bone marrow progenitor cells were grown in IMDM culture medium (Sigma-Aldrich) supplemented with 50 U/ml penicillin, 50 μg/ml streptomycin, 2 mM l-glutamine, 10% decomplemented FCS (Life Technologies), 50 μM 2-ME (Sigma-Aldrich), and 30% J558 murine GM-CSF culture supernatants for 10–12 days. At day 11, maturation of BM-DC was induced by adding LPS (5 μg/ml; Sigma-Aldrich) to culture medium for 24 h. For in vivo immunization protocols, BM-DC were used at day 12. The phenotype of BM-DC was analyzed by flow cytometry using anti-mouse CD11c, I-Ab, CD80, CD86, and CD40 mAb (BD PharMingen), and H-2Kb and H-2Db (22). In addition, BM-DC propagated from HHD2 mice were stained with MA2.1 Ab-containing ascites. Melanoma tumor cells (FON, HLA-A2+/Mart1+ (14)) were expanded in RPMI 1640 (Life Technologies) supplemented with 50 U/ml penicillin, 50 μg/ml streptomycin, 2 mM l-glutamine, 1 mM Na pyruvate (Life Technologies), and 10% decomplemented FCS (Seromed). Exosomes were either isolated using the classical process of a series of differential ultracentrifugation already described (11, 12) or isolated according to a process of ultrafiltration/diafiltration derived from Lamparski et al. (23). Briefly, 2–4 L of DC culture medium was microfiltrated (3 μm/0.8 μm) and then ultrafiltered through a 500-kDa filter up to a final volume of 50 ml. This 50 ml of exosome-containing medium was supplemented with up to 1 L of PBS, and a second step of 500-kDa ultrafiltration was performed, leading to a final volume of 20–50 ml. This preparation was ultracentrifuged at 100,000 × g onto a D20/30% sucrose gradient-density cushion (d = 1.217). The exosomal pellet recovered in the cushion was diafiltrated for sterilization and will be referred to as exosomes henceforth. A titrated mouse anti-human MHC class I mAb (HLA-A, B, C; BD PharMingen) was incubated with excess exosomes that had dried in a 96-well plate and subsequently blocked with 6% nonfat milk. After a 1-h incubation, the plate was washed and incubated with addition of excess goat anti-mouse Ab (Jackson ImmunoResearch Laboratories, West Grove, PA) conjugated to HRP for 1 h at room temperature. The plate was developed for 5 min using the ECL substrate system, as described by the manufacturer (Amersham Pharmacia, Saclay, France). Chemiluminescence signal was measured by the Wallac trilux chemiluminometer (PerkinElmer, Gaithersburg, MD). To elute the endogenous MHC class I peptides bound to exosomes, 100 μl of exosomes (∼1012 MHC class I molecules) is treated with an equal volume of acetate buffer, pH 5.1, containing the synthetic CTL epitope MelanA/Mart1(ELAGIGILTV) at 10 μM at 4°C for 30 min (ExMart1). After such an acidification, the preparation is neutralized with a Tris buffer, pH 11, on ice for 15 min to allow reformation of the trimolecular MHC class I/peptide complexes. Then unbound peptides and debris are removed using an ultracentrifugation (100,000 × g/min, 40 mn) step on a D2O/30% sucrose gradient-density cushion. The exosomes recovered in the cushion are subsequently ultracentrifuged (100,000 × g, 1 h). The pellet is resuspended in PBS once and stored at −80°C. Unbound peptides cannot exceed a final concentration of 1–7 nM. LT11, a Mart1(27, 28, 29, 30, 31, 32, 33, 34, 35)-specific HLA-A2+-restricted BV9 CD8+ T cell clone, has been previously described (14). A total of 2 × 104 DC was pulsed for 2 h with increasing amounts of exosomes (from 107 to 1010 MHC class I molecules) in 30 μl of culture medium at 37°C before incubation with 2 × 104 LT11 in a final volume of 200 μl. DC/LT11 cultures were performed in round-bottom 96-well plates in RPMI complete medium supplemented with 10% human pooled AB serum. Positive control HLA-A2+ DC were pulsed with 0.1–10 μg/ml of Mart126–35 and washed before incubation with LT11. Twenty-four-hour supernatants were assayed in IFN-γ ELISA (Immunotech, Marseille, France). A total of 2 × 104 T2 cells or 3 × 104 HLA-A2+ MD-DC was incubated with exosomes (1010 and 2 × 1010 MHC class I molecules/well, respectively, HLA-A2+ or HLA-A2−) loaded with MelanA/Mart1 at 37°C in 50 μl. After a 2-h incubation, PBL from healthy volunteers were added to T2 cells at a PBL-T2 ratio of 10:1, or to MD-DC at a PBL-DC ratio of 3:1. In the latter setting, all three components (i.e., MD-DC, exosomes, and PBL) were autologous, except for negative controls (HLA-A2− exosomes pulsed onto HLA-A2+DC). Cultures were performed in round-bottom 96-well plates in RPMI complete medium supplemented with 10% human pooled AB, 100 UI/ml IL-2 (Proleukine; Chiron, Emeryville, CA), and T cell growth factors (14). Two or three weekly stimulations of PBL were performed. Positive controls included MD-DC pulsed with 10 μM Mart126–35. On days 7, 14, and 21, the proportion of Mart1-specific CD8+ T cells was assessed in FACS using anti-CD3 FITC mAb, anti-CD45 allophycocyanin mAb, anti-CD8 PerCP mAb (all from BD Biosciences), and A2/Mart1 fluorescent soluble tetramers (0.2 μg for 1 h at room temperature; tetramers kindly provided by P. Kourilsky’s laboratory (Pasteur Institute, Paris, France) on a FACSCalibur (BD Biosciences). A2/HIVgag soluble tetramers were used as negative controls of the A2/Mart1-specific staining. LT11 were used as positive controls for the staining with A2/Mart1-soluble tetramers. The effector function of PBL following in vitro stimulation was evaluated by subjecting the cells to stimulation with T2 or autologous DC pulsed or not with 10 μM of the relevant Mart1/MelanA26–35 epitope or to the FON tumor line in the presence or absence of MA2.1 mAb neutralizing anti-HLA-A2 molecules. IFN-γ release by PBL was measured in the supernatants of the cultures in IFN-γ ELISA (Immunotech and BD PharMingen). In the T2 in vitro stimulation assays, PBL function was assessed after sorting, on a FACSVantage, of the CD8+ T cell fraction, which stained positive or negative with A2/Mart1 tetramers. Human Db (HHD2) mice derived from a strain deficient for mouse β2-microglobulin and H-2Db molecules and transgenic for a chimeric MHC class I molecule, HLA-A0201/Db, linked to the human β2-microglobulin (24), were provided by F. Lemonnier (Pasteur Institute). Transgenic mice were immunized in the footpad with 50 μl of the vaccine. Different vaccine designs were used (DC-derived exosome (Ex) alone, Ex onto mDC or iDC/peptides). Detailed experimental settings are described in figure legends. Briefly, mouse ExA2−/Mart1 (ExKb) or mouse ExA2+Mart1+/− exosomes were either inoculated directly intradermally or pulsed onto 3 × 105 H-2b mDC (DC(Kb)) or mature HHD2 DC (DC(A2)). Immunocapture assays with an internal standard allowed monitoring of the numbers of MHC class I molecules/exosome batch. Each group of three to five animals was immunized in the footpad with 4 × 108, 2 × 109, or 1010 exosomal MHC class I molecules. Other vaccines consisted of direct injection of peptide-pulsed iDC or mDC HHD2 DC. A single dose of 3 × 105 DC was loaded with increasing concentrations (from 0.01 to 10 μM) of MelanA/Mart126–35 (ELA) peptides. Each experimental group contained three to five mice, and experiments were performed at least three times. Pooled data of the most representative experiments are shown on the graphs. Mice were immunized once at day 0, and popliteal and inguinal draining LN and controlateral nodes were harvested at day 5. LN mononuclear cells were first stained with A2/Mart1 or A2/HIVgag fluorescent (PE) soluble tetramers (0.2 μg) for 30 min at room temperature in 20 μl of 1× PBS/0.5% BSA (Sigma-Aldrich), then with anti-CD3 FITC mAb and anti-CD8 allophycocyanin mAb (BD PharMingen) for 30 min at room temperature before washing steps and analysis in a FACSCalibur (BD Biosciences). Function of LN-residing T cells following immunization was assessed by challenging LN mononuclear cells to grading doses of Mart1 peptides. Supernatants were collected at 48–72 h to evaluate IFN-γ, IL-4, and IL-10 levels in ELISA (BD PharMingen). Absolute numbers of CD8+ T cells and IFN-γ levels have been analyzed using an ANOVA with Fisher’s exact method. Significances within 95 and 99% confidence interval are depicted on the graphs with ∗ and ∗∗, respectively. Comparisons between groups were performed using the nonparametric Kruskal-Wallis test. Multivesicular bodies containing exosomes are mostly evidenced in monocyte-derived DC maintained in an immature stage (CD14−, CD1a+, HLA-DRdim, CD80dim, CD86dim, and CD83−) displaying poor allostimulatory capacity in vitro (12) (data not shown). Purification of exosomes contained in culture supernatants was performed using the classical serial ultracentrifugation process or using good manufacturing procedures based on dia- and ultrafiltration steps (23), optimizing yields of exosome harvesting during upscaling. These procedures allowed isolation of a heterogeneous population of vesicles, as assessed in immunoelectronmicroscopy studies (Fig. 1⇓). Exosomes were 60- to 90-nm vesicles expressing high levels of MHC class II molecules (Fig. 1⇓) and tetraspanins such as CD81 (Fig. 1⇓C). For the first time, we show a colocalization of MHC class I with MHC class II molecules on most of the exosomes (Fig. 1⇓B). Constitutive secretion of exosomes occurred from days 5 to 7 in GM-CSF- and IL-4-containing cultures (23). The yields of exosomal MHC class I molecules recovered in a 24-h DC culture supernatant were evaluated using an immunocapture assay (22) with the anti-HLA-A-B-C mAb. From 2 × 1011 to 1012 MHC class I molecules were recovered from 3 × 107 to 108 human iDC culture/24 h.
Human DC release high amounts of exosomes. Clinical grade exosomes harvested following a diafiltration and ultrafiltration process and flotation onto a D2O/sucrose gradient-density cushion were examined in immunogold staining in electronic microscopy. 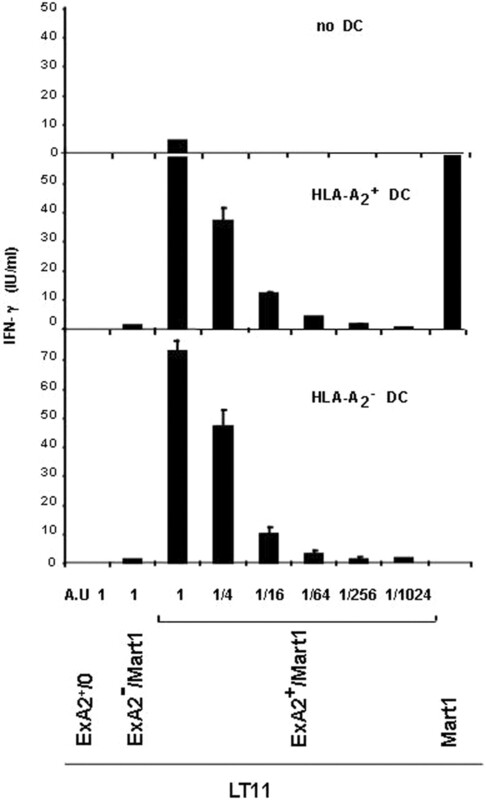 Immunogold labeling of whole mount exosomes using anti-HLA-DR (A–C), anti-MHC class I (B), anti-tetraspanin CD81 (C) mAb, and protein A coupled to 10- or 5-nm gold particles. An arrow indicates the 5-nm gold particle in B. Direct loading of the exosomal MHC class I molecules with synthetic CTL-defined epitopes, i.e., Mart1 26–35 (ELA), was undertaken following acid elution of the exosomal pellet and incubation with graduating concentrations of peptides at various pH. Optimal loading of exosomes with Mart126-35 peptide (ELA) peptides was obtained for concentrations ranging between 1 and 100 μM, at pH 5.1, as assessed using HLA-A2-binding assays in the presence of a competitive reference epitope (data not shown). To demonstrate the functionality of the HLA-A2/ELA complexes harbored on exosomes, HLA-A2+ or HLA-A2− exosomes loaded with ELA peptides (ExA2+/ELA or ExA2−/ELA, respectively) were incubated with the HLA-A*0201-restricted, ELA-specific CTL clone LT11 (14). When directly loaded onto LT11, ExA2+/ELA did not trigger IFN-γ production from LT11 at any exosome dose level (Fig. 2⇓). However, when loaded onto immature HLA-A2+DC, ExA2+/ELA induced a significant IFN-γ release by LT11 (Fig. 2⇓). ExA2+/ELA-mediated T cell activation was peptide dependent because neither ExA2+/FLU (data not shown) nor unpulsed exosomes (ExA2+/0) were efficient (Fig. 2⇓). Moreover, ExA2+/ELA-mediated LT11 activation was abrogated with an anti-MHC class I Ab (W6.32) (data not shown). To demonstrate that CTL activation results from the transfer of exosomal MHC class I/peptide complexes to DC, we showed that MHC class I molecules of the recipient DC are dispensable for LT11 activation, while exosomal MHC class I molecules are requested. Indeed, loading of HLA-A2+ DC with ExA2−/ELA (at the highest dose level, i.e., 1010) did not trigger LT11 IFN-γ production (Fig. 2⇓). Conversely, by loading HLA-A2− DC with ExA2+/ELA at various exosome dosages, we showed that ExA2+/ELA promoted IFN-γ production by LT11 as efficiently on HLA-A2− DC as on HLA-A2+ DC, as a function of exosomal MHC class I molecules (Fig. 2⇓). Exosomes transfer HLA-A2/Mart1 complexes to DC for CTL clone activation. HLA-A2− DC (lower panel) or HLA-A2+ DC (medium panel) were incubated with either unpulsed exosomes (ExA2+/0), or pulsed exosomes (ExA2−Mart1, ExA2+Mart1) at increasing dosages before coculture with an HLA-A2-restricted, MelanA/Mart1-specific CTL clone (LT11). Supernatants of 24-h cocultures were assayed in IFN-γ ELISA. Indicated values represent the mean of triplicate wells (±SEM). Experiments were repeated up to 20 times using individual NV-derived exosome batches. A.U, Arbitrary units. 1 A.U = 1010 HLA-ABC class I molecules, as assessed in immunocapture assays. Altogether, these data suggest that exosomes vehicle functional MHC class I/peptide complexes that were transferred from DC to naive DC for MHC class I-restricted T cell activation. We next investigated whether exosomal MHC class I molecules could elicit primary Mart1 (ELA)-specific CD8+ T cell responses in PBL of normal volunteers (NV). Mart1-specific CTL precursors of NV exhibit mostly a naive CD45RA/CCR7+ phenotype (25). Bulk lymphocytes were stimulated with ExA2+/ELA exosomes in the presence of autologous mDC. Following two to three rounds of in vitro stimulation with ExA2+/ELA pulsed onto DCs, 2–20% of stimulated CTLs were stained with HLA-A2/ELA-specific tetramers (Fig. 3⇓, A and B, upper panel). These CTLs released IFN-γ following coculture with HLA-A2+ DC pulsed with Mart1 (Fig. 3⇓, A and B, lower panel). Such ELA-specific CD8+ T cells did not bind to HLA-A2/HIVgag-specific tetramers (data not shown). Once again, MHC class I/peptide complexes harbored by exosomes were indispensable because ExA2−/ELA exosomes could not elicit expansion of ELA-specific CD8+ T cells in the autologous DC/PBL coculture (Fig. 3⇓A). 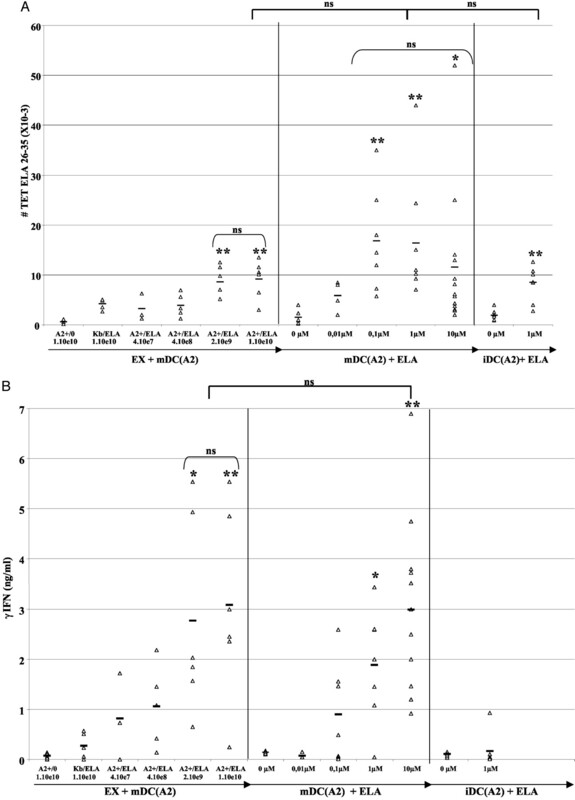 In two additional cases, expansion of ELA-specific CD8+ T cells was detectable after only one round of in vitro stimulation, and differentiated CTLs could recognize the naturally processed ELA epitope presented on the HLA-A2+, Mart1+ FON tumor line (14) in a MHC class I-dependent fashion (Fig. 3⇓, C and D). It is noteworthy that in the absence of mDC, exosomes pulsed onto PBL could not mount efficient Mart1-specific CTL responses in vitro (data not shown). Moreover, iDC could not substitute for mDC in the exosome-mediated CTL priming (data not shown). To further assess that MHC class I of the recipient APC are dispensable, we used the TAP-deficient lymphoblastoid line T2 for the transfer of exosomal MHC class I molecules. Up to 1.5% CD8+ T cells stained with the A2/Mart1-specific tetramers when naive PBL were stimulated using 1010 ExA2+/ELA vs only 0.3% using ExA2−/ELA (Fig. 4⇓). Following cell sorting of the positive fraction using the specific tetramers, CD8+ T cells produced IFN-γ when challenged with T2 pulsed with Mart1 epitopes, but not with unpulsed T2 cells. We confirmed that the negative fraction of the sorting was not Mart1 specific. 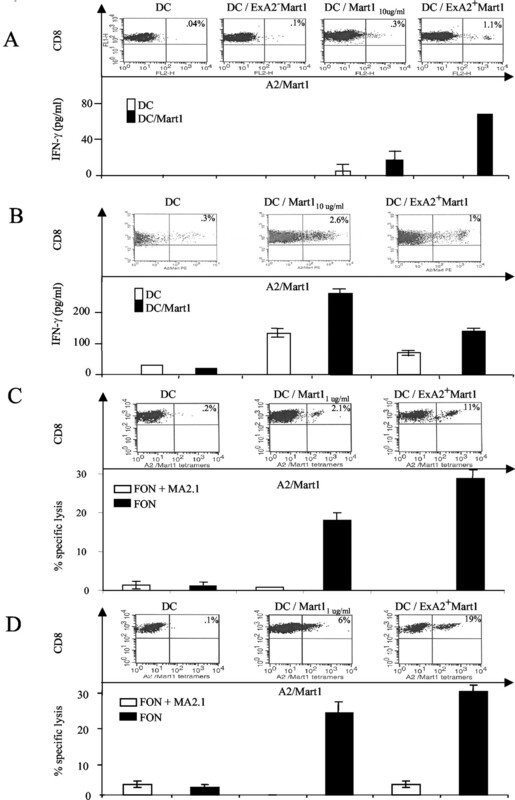 DC pulsed with ExA2+/Mart1 induce Mart1-specific CTL expansion in vitro. PBL were weekly stimulated with autologous MD-DC pulsed with either autologous ExA2+/Mart1 or allogeneic ExA2−/Mart1, or with 1–10 μM Mart126–35 peptides, as described in M&M. Upper panels, Show staining of CD3+/CD8+ T cells with A2/Mart1 fluorescent tetramers at day 21 (A, NV 1), day 14 (B, NV 2), or day 7 (C, NV 3; D, NV 4). Negative controls included irrelevant A2/HIVgag tetramers (data not shown). Lower panels, Show IFN-γ release (A and B) by expanded lymphocytes stimulated with autologous MD-DC ± Mart1 peptide (10 μM) or cytotoxicity assay (C and D) against 51Cr-labeled FON melanoma cells in the presence or absence of neutralizing anti-HLA-A2 molecules (MA2.1 mAb). Depicted values represent the mean of duplicate wells (±SEM). Each panel represents one experiment from an individual NV. The TAP-deficient lymphoblastoid T2 line pulsed with ExA2+/Mart1 induces Mart1-specific CTL expansion in vitro. PBL were weekly stimulated with T2 pulsed with ExA2+Mart1 or ExA2−Mart1. PBL were stained with A2/Mart1-soluble tetramers at day 14. Negative controls included irrelevant A2/HIVgag tetramers (data not shown). The A2/Mart1 tetramer-positive and -negative cells were then cell sorted on a FACSVantage and cocultured with T2 cells pulsed or not with 10 μM of Mart126–35. Twenty-four-hour coculture supernatants were assayed in IFN-γ ELISA. Depicted values represent the mean of duplicate wells (±SEM). Exosomes harbor functional MHC class I/peptide complexes, but require DC for efficient priming of MHC class I-restricted CTL in vitro. To examine MHC class I-restricted presentation by exosomes in vivo, we took advantage of the HHD2 transgenic mouse model, which expresses HLA-A2.1 monochain molecules in H-2 class I−/− context, therefore exhibiting significant capacity to develop HLA-A2.1-restricted CTL responses (26). In such mice deleted from the endogenous β2-microglobulin and H-2Db mouse genes, the β2-microglobulin is human and covalently linked to the HLA-A2 H chain composed of the human α1 and α2 domain. In contrast, the α3 domain remains murine. CD8+ T cells constitute only 2–5% of the LN cellularity and exhibit a biased T cell repertoire compared with C57BL/6 littermates (27). As shown in other mouse strains, BM-DC propagated from HHD2 mice were also able to constitutively secrete exosomes at an immature stage (∼day 12 in GM-CSF-enriched cultures). As mentioned for MD-DC human cultures, up to 2 × 109 exosomal MHC class I molecules were purified from 105 mouse BM-DC cultures in 24 h. Immunogenicity of HHD2-derived exosomes was assessed in HHD2 mice. 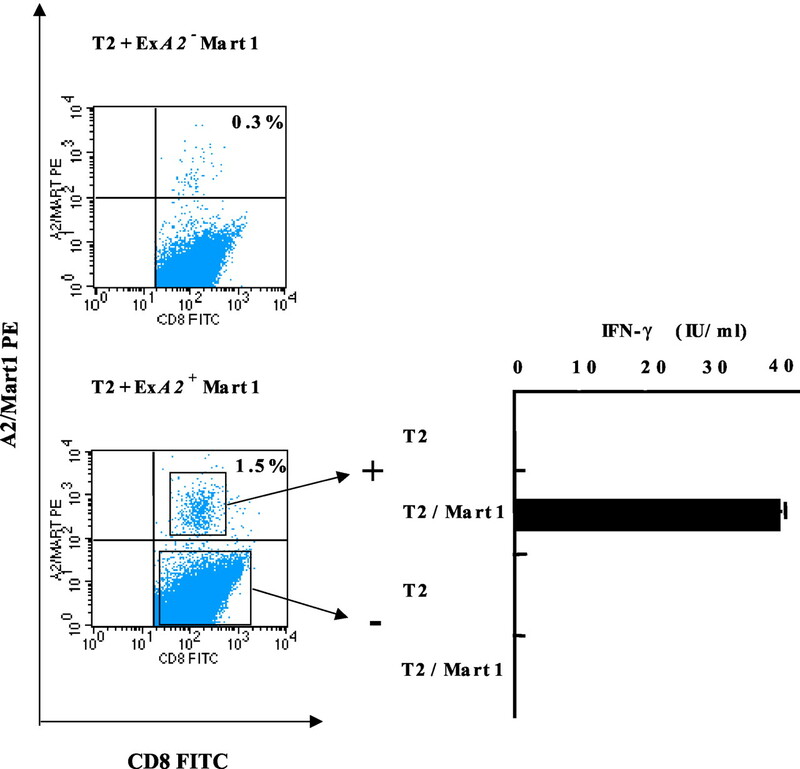 Analyses of CD3+/CD8+ T cell binding to A2/Mart1-soluble fluorescent tetramers were performed in the draining LN, 5 days after inoculation of exosomes in the footpad. Immunization with 1010-1011 exosomal A2+/ELA complexes did not allow specific CTL expansion in LN (Fig. 5⇓). Even in prime-boost settings with two injections of exosomes 10 days apart, no specific CTL expansion was observed (data not shown). In contrast, when loaded onto mDC (LPS-activated HHD2 (DC-A2) or H-2-Kb wild-type DC (DC(Kb))), exosomes bearing 109–1010 MHC class I molecules significantly promoted the differentiation of 4–5% specific CTLs among CD8+ T lymphocytes (p < 0.01; Fig. 5⇓). Expansion of specific CD8+ T cells following immunization with DC(Kb)/ExA2+/ELA was peptide dependent because unpulsed exosomes DC(Kb)/ExA2+/0 did not significantly induce specific CTL proliferation (p > 0.05 compared with naive LN and p < 0.01 compared with DC(Kb)/ExA2+/ELA; Fig. 5⇓A). The HLA-A2 molecules harbored by exosomes were indispensable because ExKb derived from wild-type B6 BM-DC and pulsed with ELA epitopes (ExA2−/ELA) did not significantly expand tetramer-binding CD8+ T cells (p > 0.05 compared with naive LN and p < 0.05 compared with ExA2+/ELA; Fig. 5⇓A). In this experimental setting, mDC(HHD2) are also efficient peptide-presenting cells with significant induction of Mart1-specific CTLs after pulsing with 10 μM Mart126–35 epitopes (up to 10% A2/ELA-specific CTL among CD8+ T cells, p < 0.01 compared with naive LN and unpulsed mDC (HHD2); Fig. 5⇓). Background staining using nonspecific A2/gag tetramers was not significant (Fig. 5⇓B). It is noteworthy that exosome transport by DC is efficient across species barriers because loading of mDC(Kb) with human ExA2+/ELA generated from NV allowed expansion of specific CD8+ T cells in HHD2 mice (36). Exosomes require DC to induce expansion of specific CD8+ T cells in vivo. HHD2 mice were immunized at day 0 in the footpad with autologous (EXA2+) or allogeneic exosomes (EXKb) pulsed with Mart126–35 peptides (/ELA) or not pulsed (/0) at a dosage of 1010 MHC class I molecules (unless otherwise specified). Alternatively, exosomes were loaded onto allogeneic H-2b mature BM-DC. Positive controls were mice inoculated with autologous mature BM-DC pulsed with 10 μM of Mart1 (ELA). −, Represents naive LN. At day 5, mononuclear cells (Figure legend continues) of the draining LN were examined for the staining with A2/Mart1- or A2/HIVgag-soluble fluorescent tetramers. The absolute numbers (A) and percentage (B) of tetramer-positive cells in the gated CD3+/CD8+ cells are shown. Each dot of A or dot-plot graph in B represents data obtained from one mouse. The staining achieved with an irrelevant tetramer (A2/HIVgag) on relevant nodes represents the background mumbers of tetramer-positive lymphocytes; data not shown in the figure (the mean ± SEM percentage of tetramer staining with A2/gag HIV on relevant nodes (n = 20) was 0.16 ± 0.13, representing absolute numbers of 437 ± 250 cells). A, Depicts the data relevant for three independent experiments. ∗∗, Indicates statistically significant differences at 0.01 confidence interval using Fisher’s exact method. Ns, Not significant at 5% confidence interval. Ideal vaccines should combine CTL with helper epitopes, and be molecularly defined, stable, and out-of-shelf reagents. Efficient immunization with CTL-defined epitopes was reported using peptides associated with synthetic (such as CpG sequences) or natural adjuvants (mDC) in mouse. Therefore, we first analyzed HLA-A2.1-restricted, Mart1-specific CTL priming in HHD2 mice following immunization with 3 × 105 iDC or mDC propagated from HHD2 bone marrow (iDC(A2), mDC(A2), respectively) and pulsed with 0.01- to 10-μM ranges of Mart126–35 peptides (only shown with 1 μM for iDC). In the absence of LPS activation, iDC(A2) express low surface expression levels of I-Ab class II, CD40, CD80, and CD86 molecules (data not shown). Following 24 h of LPS stimulation, BM-DC acquire an activated phenotype (mDC(A2)) with surface expression of I-Ab and costimulatory molecules associated with allostimulatory capacities in vitro (data not shown). Both mDC(A2) and iDC(A2) elicited significant Mart1-specific CTL expansion in HHD2 mice (Fig. 6⇓A). In both cases, the peptide concentration threshold necessary to initiate CTL expansion appeared to be above 0.01 μM (Fig. 6⇓A). Importantly, only mDC (HHD2) and not iDC (HHD2) promoted Tc1 IFN-γ-producing CTL (Fig. 6⇓B). The threshold for mDC-mediated Tc1 differentiation was above 0.1 μM peptide concentrations (p > 0.05 between 0.1 μM mDC and unloaded mDC, p < 0.01 between 1 μM mDC and unloaded mDC, p < 0.01 between 10 μM mDC and unloaded mDC; Fig. 6⇓B) with a plateau reached at 1 μM of Mart126–35 (p > 0.05 between 1 and 10 μM mDC). IFN-γ production of LN-residing CTL was peptide dependent because a Mart1 peptide dose response for IFN-γ secretion was demonstrated (data not shown). Legend continues Exosomes mimick the effects of mDC in the initiation of CTL responses specific for synthetic peptides. Immunizations were performed with various peptide-based vaccines. Same experimental setting than in Fig. 5⇑ using either: 1) 3 × 105 immature HHD2 BM-DC (iDC), or 2) LPS-matured BM-DC (mDC) pulsed with grading doses of Mart126–35 peptides (ELA), or 3) grading dosages of exosomes pulsed onto 3 × 105 mature HHD2 BM-DC. A, Depicts absolute numbers of CD3+/CD8+ lymphocytes of the draining LN staining with A2/Mart1-specific tetramers, while B shows Mart1-dependent IFN-γ secretion of LN mononuclear cells challenged with 10 μM of Mart1 peptides in 48-h in vitro cultures. Each dot represents data obtained from one mouse. The staining achieved with the irrelevant tetramer (A2/HIVgag) on relevant nodes represents the background numbers of tetramer-positive lymphocytes; data not shown in the figure (the mean ± SEM percentage of tetramer staining with A2/gag HIV on relevant nodes (n = 20) was 0.16 ± 0.13, representing absolute numbers of 437 ± 250 cells). Each panel depicts the data relevant for three independent experiments. ∗, Indicates statistically significant differences at 0.05 confidence interval (and ∗∗ at 0.01) using Fisher’s exact method. ns, Not significant at 5% confidence interval. Because we demonstrated that efficient MHC class I-restricted Ag presentation could be achieved using mDC and exosomes, we aimed at comparing efficacy of Tc1 differentiation using exosomes vs mDC. Immunization with exosomes pulsed with Mart126–35 epitopes was performed between 108 and 1010 MHC class I molecular ranges in the presence of mDC (HHD2) (Fig. 6⇑). As already reported, Fig. 5⇑ using H-2b allogeneic mDC, exosomes loaded onto syngeneic mDC(A2) significantly expanded ELA-specific CTL (Fig. 6⇑A, p < 0.01) that differentiate into potent Tc1 (Fig. 6⇑B, p < 0.01) with a plateau reached at 2 × 109 MHC class I molecules (p > 0.05 between 2 × 109 ExA2+/ELA and 1 × 1010 ExA2+/ELA; Fig. 6⇑). Tc1 differentiation was peptide dependent because unpulsed exosomes (ExA2+/0) did not significantly promote IFN-γ-secreting CD8+ T cells (Fig. 6⇑B). Once again, MHC class I/peptide complexes from exosomes were indispensable because ExKb/ELA pulsed onto mDC (HHD2) did not significantly induce differentiation of specific Tc1 (p > 0.05 compared with ExA2+/0 and p < 0.05 compared with ExA2+/ELA; Fig. 6⇑B). In all cases, IFN-γ secretion by LN-residing CD8+ T cells was peptide dependent (data not shown). Finally, immunogenicity of 2 × 109-1010 exosomal ExA2+/ELA complexes was compared with that mediated by 3 × 105 mDC(A2) pulsed with saturating concentrations of peptides in HHD2 mice. Indeed, in our model system, a plateau of Tc1 differentiation was achieved with mDC using ∼0.3–0.5 × 105/footpad injection (data not shown). The threshold for exosome efficacy in Tc1 priming was ∼2 × 109 MHC class I molecules with no additional benefit at 1010 MHC class I complexes when pulsed onto mDC(A2). Importantly, there is no statistically significant difference between: 1) 2 × 109 or 1010 ExA2+/ELA and mDC pulsed with 0.1–10 μM Mart1 regarding the expansion of A2+Mart1+ tetramer-binding CD8+ T cells (p > 0.05; Fig. 6⇑A), and 2) 2 × 109 or 1010 ExA2+/ELA and mDC pulsed with 1–10 μM Mart1 regarding the priming of Mart1-specific Tc1 (p > 0.05; Fig. 6⇑B). Exosomes can be considered as immunogenic vehicles of MHC class I/peptide complexes secreted by DC for the differentiation of Tc1 cells. Moreover, exosomes mimick the capacity of mDC to initiate synthetic peptide-specific CD8+ T cell responses in vivo. Following our study showing that DC-derived exosomes promote T cell-dependent antitumor immune responses in vivo (12), we aimed at elucidating the mechanisms of CTL priming by exosomes in vivo. Our data demonstrate that: 1) exosomal MHC class I/peptide complexes efficiently induce peptide-specific, MHC class I-restricted CD8+ T cell expansion and differentiation in vitro and in vivo; 2) exosome immunogenicity requires transfer onto APCs; 3) CTL priming against a synthetic class I-restricted epitope is achieved as efficiently with mDC- as with DC-derived exosomes. Exosome production is an elective feature of DC at an immature stage when multivesicular bodies still form in the cytosol. This stage might correspond to macropinocytosis-mediated microenvironmental scanning and uptake of surrounding Ag for sequestration in MHC class II compartments. After activation, stored Ags are processed and loaded onto neosynthetized MHC molecules (2). We bypassed the need for endogenous Ag processing by directly pulsing the candidate model Ag onto exosomes. Our ex vivo process of peptide loading onto exosomal HLA-A2.1 molecules was efficient and allowed triggering of peptide-specific CTL clones and priming of naive Mart1-specific, HLA-A2-restricted CD8+ T cells in lymphocytes of several NV. CTL lines differentiated using DC-derived exosomes recognize not only the synthetic peptide, but also the naturally processed Mart1 epitope presented on tumor cells. CTL priming by DC-derived exosomes is efficient and requires activated or mature DC. Indeed, triggering of CTL clones using exosomes required iDC presumably because clones do not need costimulatory signals. Otherwise, LPS-activated human monocyte-derived DC or BM-DC were used for efficient CTL priming in vitro and in vivo. Other reports showed transfer of functional MHC class I/peptide complexes by exosomes to DC (28, 29). Nevertheless, while MHC class I molecules of the recipient DC are dispensable for efficient exosome-mediated CTL priming, functional exosome-associated MHC class I molecules are needed in vitro and in vivo. The evidence that exosomes are even more efficient at CTL priming than micromolar ranges of peptides in CpG oligomers further supports that: 1) exosome bioactivity cannot be accounted for by free HLA-A2-unbound peptides; 2) exosomes require innate immune responses eventually leading to DC activation (36). Adjuvantization of exosomes with mDC allowed recruitment (2–5×; data not shown) of CD4+ T cells in the draining LN, although no defined MHC class II epitopes were copulsed onto exosomes in our experiments. Nevertheless, such a CD4+ T cell help might be required for the Mart1-specific CTL priming that we observed because exosomes injected in the absence of adjuvants (i.e., mDC or CpG) did not allow expansion of CD4+ T cells in popliteal homolateral nodes. Importantly, adjuvantization of exosomes with CpG was absolutely required for exosomes to mediate tumor rejection (36). Membrane transfer has been abundantly reported in vitro, in systems requiring or not cell to cell contacts (16). The observation that alive DCs transfer antigenic material to other DCs has already been suggested. Harshyne et al. (5) have shown that genetically modified monkey DCs transfer gp100 to human DCs for cross-presentation. In this study, antigenic transfer was mediated by plasma membrane material and inhibited by a 0.4-μm-diameter filter. Knight et al. (6) have shown that DC acquire Ag from cell-free DC supernatant. Our data underscore that exosomes could be mediators of antigenic exchange in between DC or APC. The in vivo relevance of this hypothesis remains unclear. It is conceivable that following Ag uptake by DC in the periphery, DC migration be hampered and processed Ags be released via exosomes for appropriate Ag presentation in LN. It has been shown in mice that CD8α+ lymphoid DC could generate an immune response after s.c. injection without homing to draining LN (30). Likewise, when antigenic dose is limiting (i.e., low viral load), it is conceivable that a system of antigenic spreading or amplification might exist. In these pathophysiological conditions, one might expect that processing of the exogenous Ag by a few DC would be sufficient to overload the surrounding DC with functional MHC class I and II/peptide complexes for initiation of T cell responses. Such a process would require an efficient secretion of preformed immunological synapses that should be uptaken by other APC in a targeted and saturable manner. At first, we showed that: 1) an iDC can secrete in vitro at least as many MHC class I molecules as what is presented on its plasma membrane (up to 104 MHC class I molecules/24 h in vitro); 2) such exosomal MHC class I molecules are in a bioactive conformational form. We set up our in vivo priming system showing that up to 3 × 105 mDC pulsed with saturating amounts of synthetic peptides (1 μM) reach a plateau for Tc1 differentiation. Exosome-mediated Tc1 priming reached a plateau at ∼2 × 109 MHC class I/peptide complexes. In this model system, ∼2 × 109 exosomal MHC class I molecules released by 105 DC are as efficient as 3 × 105 mDC loaded with saturating μM ranges of peptides for the expansion and differentiation of synthetic peptide-specific Tc1 lymphocytes in vivo. Western blot analyses of proteins contained in exosomes and DC lysates using anti-MHC class I Ab appear to indicate that 3 × 105 mDC present ∼3 × 1010 MHC class I molecules (data not shown), 10 times more than the efficient MHC class I exosomal priming dosage required in our system. Affinity of peptide loading onto exosomes vs mDC and the respective avidity of the TCR in various peptide model systems are critical parameters to consider (31, 32) in comparing DC and exosome immunogenicity. However, our data support that exosomal MHC class I complexes elicit potent primary CD8+ T cell responses with higher affinity for the TCR than peptides. Second, unloaded exosomes can compete with peptide-loaded exosomes for T cell activation in vitro (our unpublished data), suggesting that exosome uptake by DC might be saturable and receptor mediated. Third, the αVβ3 and αVβ5 integrin-binding lactadherin has been shown to be a relevant candidate molecule for the uptake and/or clearance of apoptotic bodies (33) and is overexpressed on mouse DC-derived exosomes (18). However, the role of lactadherin for exosome targeting to DC remains to be elucidated. Interestingly, Denzer et al. (34) were able to show that follicular DC (FDC) that do not synthetize MHC class II molecules can nevertheless bear MHC class II molecules at their surface in vivo. They provide evidence for elective binding of B lymphocyte-derived exosomes to FDC, but not to other APC in vitro, eluding to the targeted transfer of exosomal MHC class II molecules from B cells to FDC. We have recent evidence of the presence of exosomes in vivo in peritoneal or pleural effusions of cancer patients (22). Such exosomes harvested from biological fluids bear high levels of candidate tumor Ags, MHC class I, and heat shock protein 70–90 molecules. Ascitis-derived exosomes could elicit MHC class I-restricted, tumor-specific T cell recognition in autologous settings in vitro. In this setting, MHC class I-restricted cross-presentation of tumor Ags by autologous DC and direct presentation of preformed MHC class I/peptide complexes harbored on exosomes could account for the immunogenicity of tumor ascitis-derived exosomes. Regardless of their immunological relevance, exosomes represent valuable vectors of MHC class I or II molecules (35) that can be loaded with synthetic peptides of choice. Long-term allogeneic DC culture systems or cell lines are awaited to generate large amounts of out-of-shelf exosomal reagents exhibiting MHC complexes of given relevance in various immunization protocols. We thank Dee wei Hsu for providing some materials and methods for exosomal GMP production, and C. Théry for critical review of the manuscript and fruitful discussions. We are indebted to Dominique Gambaud, Annick Duval, and Christian Loy from Etablissment Français du Sang Nord de France for assistance with the apheresis, and to P. Ardouin and its animal facility for mice handling. ↵1 This work (and N.E.C.S.) was supported by European Community Grant QLRT-2001-00093, the LIGUE française contre le Cancer, the Association pour la Recherche sur le Cancer, and the Ministry of Luxembourg (to N.E.C.S.). F.A. was supported by a Young Investigator Award from the American Society of Clinical Oncology. N.C. was supported by a European Fellowship in the QLRT-2001-00093. N.E.C.S. was supported by the Ministère de la Culture, de l’Enseignement supérieur et de la Recherche du Luxembourg, and by the Fondation Luxembourgeoise Contre le Cancer. This work was also supported by Anosys, Inc.
↵2 F.A., N.C., E.A., and L.Z. contributed equally to this study. ↵4 Abbreviations used in this paper: DC, dendritic cell; BM-DC, bone marrow-derived DC; Ex, DC-derived exosome; FDC, follicular DC; iDC, immature DC; LN, lymph node; MD-DC, monocyte-derived DC; mDC, mature DC; NV, normal volunteer; Tc1, effector T lymphocyte producing IFN-γ; ELA, Mart126-35 peptide. Lanzavecchia, A., F. Sallusto. 2000. From synapses to immunological memory: the role of sustained T cell stimulation. Curr. Opin. Immunol. 12:92. Schüler, G., R. M. Steinman.. 1985. Murine epidermal Langherans cells mature into potent immunostimulatory dendritic cells in vitro. J. Exp. Med. 161:526. Harshyne, L. A., S. C. Watkins, A. Gambotto, S. M. Barratt-Boyes. 2001. Dendritic cells acquire antigens from live cells for cross-presentation to CTL. J. Immunol. 166:3717. Knight, S. C., S. Iqball, M. S. Roberts, S. Macatonia, P. A. Bedford. 1998. Transfer of antigen between dendritic cells in the stimulation of primary T cell proliferation. Eur. J. Immunol. 28:1636. Patel, D. M., P. Y. Arnold, G. A. White, J. P. Nardella, M. D. Mannie. 1999. Class II MHC/peptide complexes are released from APC and are acquired by T cell responders during specific antigen recognition. J. Immunol. 163:5201. Arnold, P. Y., M. D. Mannie. 1999. Vesicles bearing MHC class II molecules mediate transfer of antigen-presenting cells to CD4+ cells. Eur. J. Immunol. 29:1363. Johnstone, R. M., M. Adam, J. R. Hammond, L. Orr, C. Turbide. 1987. Vesicle formation during reticulocyte maturation: association of plasma membrane activities with released vesicles (exosomes). J. Biol. Chem. 262:9412. Pan, B. T., K. Teng, C. Wu, M. Adam, R. M. Johnstone. 1985. Electron microscopic evidence for externalization of the transferrin receptor in vesicular form in sheep reticulocytes. J. Cell Biol. 101:942. Raposo, G., H. W. Nijman, W. Stoorvogel, R. Liejendekker, C. V. Harding, C. J. Melief, H. J. Geuze. 1996. B lymphocytes secrete antigen-presenting vesicles. J. Exp. Med. 183:1161. Zitvogel, L., A. Regnault, A. Lozier, J. Wolfers, C. Flament, D. Tenza, P. Ricciardi-Castagnoli, G. Raposo, S. Amigorena. 1998. Eradication of established murine tumors using a novel cell-free vaccine: dendritic cell-derived exosomes. Nat. Med. 4:594. Skokos, D., S. L. Panse, I. Villa, J.-C. Rousselle, R. Peronet, B. David, A. Namane, S. Mercheri. 2001. Mast cell-dependent B and T lymphocyte activation is mediated by the secretion of immunologically active exosomes. J. Immunol. 166:868. Wolfers, J., A. Lozier, G. Raposo, A. Regnault, C. Thery, C. Masurier, C. Flament, S. Pouzieux, F. Faure, T. Tursz, et al 2001. Tumor-derived exosomes are a source of shared tumor rejection antigens for CTL cross-priming. Nat. Med. 7:297. Van Niel, G., G. Raposo, C. Candalh, M. Boussac, R. Hershberg, N. Cerf-Bensussan, M. Heyman. 2001. Intestinal epithelial cells secrete exosome-like vesicles. Gastroenterology 121:337. Thery, C., L. Zitvogel, S. Amigorena. 2002. Exosomes: composition, biogenesis and function. Nat. Rev. Immunol. 2:569. Denzer, K., M. J. Kleijmeer, H. F. G. Heijnen, W. Stoorvogel, H. J. Geuze. 2000. Exosomes: from internal vesicle of the multivesicular body to intercellular signaling device. J. Cell Sci. 113:3365. Thery, C., A. Regnault, J. Garin, J. Wolfers, L. Zitvogel, P. Ricciardi-Castagnoli, G. Raposo, S. Amigorena. 1999. Molecular characterization of dendritic cell-derived exosomes: selective accumulation of the heat shock protein hsc73. J. Cell Biol. 147:599. Thery, C., M. Boussac, P. Veron, P. Ricciardi-Castagnoli, G. Raposo, J. Garin, S. Amigorena. 2001. Proteomic analysis of dendritic cell-derived exosomes: a secreted subcellular compartment distinct from apoptotic vesicles. J. Immunol. 166:7309. Escola, J.-M., M. J. Kleijmeer, W. Stoorvogel, J. M. Griffith, O. Yoshie, H. J. Gueze. 1998. Selective enrichment of tetraspan proteins on the internal vesicles of multivesicular endosomes and on exosomes secreted by human B-lymphocytes. J. Biol. Chem. 273:20121. Bernard, J., D. Ittelet, A. Christoph, G. Potron, J. C. Adjizian, S. Kochman, M. Lopez. 1998. Adherent-free generation of functional dendritic cells from purified blood monocytes in view of potential clinical use. Hematol. Cell Ther. 40:17. André, F., N. E. Schartz, M. Movassagh, C. Flament, P. Pautier, P. Morice, C. Pomel, C. Lhommé, B. Escudier, T. Le Chevalier, et al 2002. Malignant effusions and immunogenic tumor-derived exosomes. Lancet 360:295. Lamparski, H., A. Metha-Damani, J. Yao, S. Patel, D. Hsu, C. Ruegg, J. B. Le Pecq. 2002. Production and characterization of clinical grade exosomes derived from dendritic cells. J. Immunol. Methods 270:211. Ikarashi, Y., R. Mikami, A. Bendelac, M. Terme, N. Chaput, M. Terada, T. Tursz, E. Angevin, F. A. Lemonnier, H. Wakasugi, L. Zitvogel. 2001. Dendritic cell maturation overrules H-2D-mediated natural killer T (NKT) cell inhibition: critical role for B7 in CD1d-dependent NKT cell interferon γ production. J. Exp. Med. 194:1179. Pittet, M. J., A. Zippelius, D. Valmori, D. E. Speiser, J. C. Cerottini, P. Romero. 2002. MelanA/Mart1-specific CD8 T cells: from thymus to tumor. Trends Immunol. 23:325. Firat, H., M. Cochet, P. S. Rohrlich, F. Garcia-Pons, S. Darche, O. Danos, F. A. Lemonnier, P. Langlade-Demoyen. 2002. Comparative analysis of the CD8+ T cell repertoires of H-2 class I wild type/HLA-A2.1 and H-2 class I knockout/HLA-A2.1 transgenic mice. Int. Immunol. 14:925. Pascolo, S., N. Bervas, J. M. Ure, A. G. Smith, F. A. Lemonnier, B. Perarnau. 1997. HLA A2.1 restricted education and cytolytic activity of CD8+ T lymphocytes from β2-microglobulin (β2m) HLA A2.1 monochain transgenic H-2Db β2m double knockout mice. J. Exp. Med. 185:2043. Théry, C., L. Duban, E. Segura, P. Véron, O. Lantz, S. Amigorena. 2002. Exosomes activate naive CD4+ T cells by transfer of MHC/peptide complexes to dendritic cells. Nat. Immun. 3:1156. Vincent-Schneider, H., P. Stumptner-Cuvelette, D. Lanka, S. Pain, G. Raposo, P. Benaroch, C. Bonnerot. 2002. Exosomes bearing HLA-DR1 molecules need dendritic cells to efficiently stimulate specific T cells. Int. Immunol. 14:713. Smith, A. L., B. F. de St Groth. 1999. Antigen-pulsed CD8α+ dendritic cells generate an immune response after subcutaneous injection without homing to the draining lymph node. J. Exp. Med. 189:593. Kropshofer, H., S. Spindeldreher, T. A. Rohn, N. Platania, C. Grygar, N. Daniel, A. Wolpl, H. Langen, V. Horejsi, A. B. Vogt. 2002. Tetraspan microdomains distinct from lipid rafts enrich select peptide-MHC class II complexes. Nat. Immun. 3:61. Hanayama, R., M. Tanaka, K. Miwa, A. Shinohara, A. Iwamatsu, S. Nagata. 2002. Identification of a factor that links apoptotic cells to phagocytes. Nature 417:182. Denzer, K., M. van Eijk, M. J. Kleijmeer, E. Jakobson, C. de Groot, H. J. Geuze. 2000. Follicular dendritic cells carry MHC class II-expressing microvesicles at their surface. J. Immunol. 165:1259. Escudier, B., T. Dorval, E. Angevin, C. Boccaccio, C. Robert, M. F. Avril, O. Lantz, C. Bonnerot, T. Tursz, O. Dhellin, et al 2002. Novel approach to immunotherapy of cancer: phase I trial of dexosome vaccine for patients with advanced melanoma. Proc. Am. Soc. Clin. Oncol :A1857. Chaput, N., N. E. C. Schartz, F. Andre, J. Taieb, S. Novault, P. Bonnaventure, N. Aubert, J. Bernard, F. Lemonnier, M. Merad, et alExosomes as potent cell-free peptide-basedvaccine. II. Exosomes in CpG adjuvants efficiently prime naive Tc1 lymphocytes leading to tumor rejection. J. Immunol 172:2137.